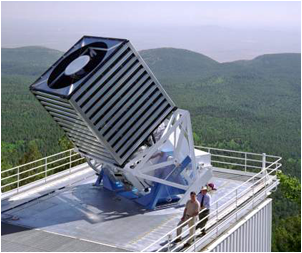 The 2.5-meter telescope at Apache Point Observatory, named the Sloan Foundation Telescope in recognition of the pivotal and generous support of the Alfred P. Sloan Foundation through all phases of the SDSS. Frieman earned a B.Sc. degree from Stanford (1981) and a PhD in Physics from the University of Chicago (1985). After a postdoc in the SLAC Theory Group, he joined the scientific staff at Fermilab in 1988. He served as Head of the Theoretical Astrophysics Group from 1994 to 1999. He is a Fellow of the American Physical Society and of the American Association for the Advancement of Science and a Trustee of the Aspen Center for Physics. He has served on the Executive Committee of the APS Divison of Astrophysics, on the Particle Physics Project Prioritization Panel (P5) of HEPAP, on the Astro 2010 Decadal Survey Committee, and on the Astronomy and Astrophysics Advisory Committee (AAAC). Frieman's research centers on theoretical and observational cosmology, including studies of the nature of dark energy, the early Universe, gravitational lensing, the large-scale structure of the Universe, and supernovae as cosmological distance indicators. The author of over 230 publications, he led the Sloan Digital Sky Survey (SDSS-II) Supernova Survey, which discovered over 500 type Ia supernovae for cosmology studies, and served as chair of the SDSS Collaboration Council. 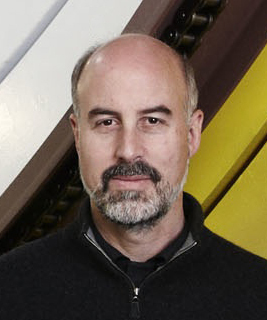 He is a founder of and currently serves as Director of the Dark Energy Survey, a collaboration of over 120 scientists from 20 institutions on 3 continents, which is building a 570-Megapixel camera to carry out a wide-field survey on the Blanco 4-meter telescope at Cerro Tololo Inter-American Observatory in Chile to probe the origin of cosmic acceleration. PhD Thesis Defense, Cameron Liang, "Multiphase Gaseous Halos around Galaxies"
KICP Talk, Computations in Science Seminar: Joshua A Frieman, "The Dark Energy Survey"
Workshop, Joshua Frieman in the Deborah Stratman film "The Illinois Parables"
PhD Thesis Defense, Benedikt Diemer, "On the (non-)universality of halo density profiles"
KICP Event, World Science Festival Salon: "Dark Energy: Measuring a Mystery"
KICP Workshop, International conference: "Type Ia Supernovae: progenitors, explosions, and cosmology"
KICP Event, Statistics Colloquium: Josh Frieman, Fermilab and the University of Chicago, "Probing Cosmic Acceleration with the Dark Energy Survey: Statistical Challenges and Big Data in Cosmology"
KICP Talk, Live Google Hangout: "Dark Energy: On the Brink of Discovery?" PhD Thesis Defense, Yeunjin Kim: "The effect of the nuclear burning during the deflagration on the final observables in Supernovae type Ia"
KICP Event, Webcast with Josh Frieman, "Can a New Camera Unravel the Nature of Dark Energy?" PhD Thesis Defense, Jean-Rene Gauthier, "A comprehensive study of the cool gas content of massive dark matter halos"
KICP Lecture, Josh Frieman, "The Dark Universe"
KICP Lecture, Benjamin Dean Lecture: Josh Frieman, "The Dark Universe and the Origin of Structure"
KICP Talk, Josh Frieman, Mapping the Heavens: "The Universe Revealed by the Sloan Digital Sky Survey"